Every year, around Christmas time, we hear a lot about the fact that Jesus was "born in a manger." There are even songs about it! However, it is important to point out--as I often do to my students, since it's one of my pet peeves--that Jesus was not born in a manger. According to the Gospel of Luke, he was "laid in a manger"--i.e., a feeding trough for animals--"because there was no place for them in the inn" (Luke 2:7). This suggests that he was born someplace where animals were housed--probably some kind of stable. "Christ found no room in the Holy of Holies that shone with gold, precious stones, pure silk and silver. He is not born in the midst of gold and riches, but in the midst of dung, in a stable where our sins were filthier than the dung. He is born on a dunghill in order to lift up those who come from it: 'From the dunghill he lifts up the poor' (Ps 113:7)" (Jerome, On the Nativity of the Lord, ACCSNT 3:39). Leave it to Jerome to get right to the point and never mince words. Given that's it's Christmas Eve, I thought I'd post something relating to the high holy day. Here I want to focus on a line most people know from Luke's account of Jesus' birth--the reference to his swaddling clothes. The significance of Jesus' swaddling clothes is often overlooked. But notice that the angel specifically explains that the fact that Jesus will be found in swaddling clothes will be part of the "sign" to them of his true identity as the Savior (Luke 2:12). Why is that? To fully understand the importance of Jesus' swaddling clothes we need a little background. In Luke's Gospel it is abundantly clear that Jesus is the "Messiah," which means the "anointed one", in Greek the christos--he is the Christ, the Son of David. Of course, the Davidic association with Jesus' role is obvious if you know the Old Testament. In recounting his last words, 2 Samuel 23 calls David, "the anointed of the God of Jacob, the sweet psalmist of Israel" (2 Sam 23:1). "... will be great, and will be called the Son of the Most High; and the Lord God will give to him the throne of his father David, ﻿33﻿ and he will reign over the house of Jacob for ever; and of his kingdom there will be no end" (Luke 1:32-33). Later, Zechariah proclaims that the Lord "has raised up a horn of salvation for us in the house of his servant David" (Luke 1:69). The Davidic themes continue in the story of Jesus' birth. He is born in Bethlehem, the city David had come from (cf. 1 Sam 16). In fact, Luke makes the Davidic association with Bethlehem explicit. "And Joseph also went up from Galilee, from the city of Nazareth, to Judea, to the city of David, which is called Bethlehem, because he was of the house and lineage of David" (Luke 2:4). As mentioned above, the angels also allude to Jesus' role as the Son of David in their announcement to the shepherds: "﻿for to you is born this day in the city of David a Savior, who is Christ the Lord" (Luke 2:11). So what's the significance of Jesus' appearance? 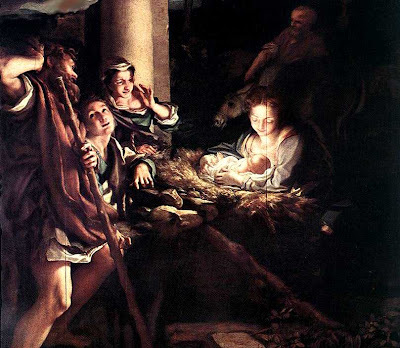 Why is it a sign that the royal son of David is born in such a humble setting rather than into extravagance? Jesus' humble birth is a sign that he really is the true Son of David. Like Solomon (before he fell away from the Lord), he is not about power, might or glory. Indeed, it would seem that along these lines the fact that he has even more humble birth might suggest that he is somehow even more worthy of glory. And, of course, he too is wrapped in swaddling clothes. The Son of David, the Messiah is born. Glory to God! Since becoming a father this year--watching my son's growth on multiple ultrasounds, being present in the operating room where he was delivered, and spending everyday with my wife learning to love him even more--I've come to a profoundly strong realization of the evil of abortion. Here's a shocking video on the founder of Planned Parenthood--the largest abortion provider in America-- everyone should watch. I've heard these things about Sanger before, but I had not heard it in her very own words! This is horrifying. Of course, she is still hailed as a hero by Planned Parenthood today, which is quite telling if you ask me. This is a story I've been closely following for some time now, but have held off posting on out of caution. However, it seems as though the evidence is beginning to look pretty solid. 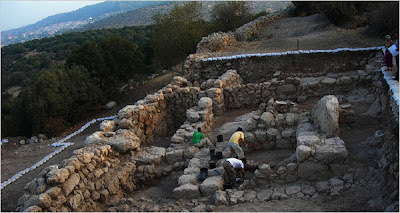 In sum, an archaeological dig at Khirbet Qeiyafa, which was reported on a few months ago by the New York Times, is turning out finds that are rocking the scholarly community. And, while at the time, the New York Times reported that only a small piece of the site had been excavated, information is pouring out that even more striking evidence has been uncovered. This may very well go down as the "21st century Dead Sea Scrolls". However, while the DSS helped illuminate the New Testament, Khirbet Qeiyafa is shedding incredible light on a much, much earlier period, apparently corroborating the historicity of the Old Testament. But I'm getting ahead of myself. Let me give some background here. Many scholars dispute the historical reliability of the Old Testament, particularly the parts prior to Ezra and Nehemiah: e.g., David, Solomon, the kingdom, etc. Why? According to many scholars the stories about the glorious reign of David and Solomon are myths--of little more value than the stories about King Arthur and the Roundtable. All of it was made up. When Israel returned from their Babylonian exile the past history of Israel was "invented". In fact, for some historians there never even were twelve tribes in Israel. The Israelites "idealized" their past. The story of the apostasy of Solomon and the sinfulness of the Israelites were created for two purposes. First, it gave the Jews a claim on the land. Second, it gave the Jews a reason to remain obedient to the priestly leaders. In sum, the Old Testament narratives about David, Solomon--not too mention that of Abraham and the Patriarchs--were nothing more than political propoganda. Some scholars believed Israelite writing didn't even exist at that point. Perhaps, such scholars might concede, there were some tribal leagues and small villages, but a kingdom of David? Such scholars--often called "minimalists"--would laugh and say, no way. Evidence at Khirbet Qeiyafa suggests that in fact there was a massive political force in the land of Israel in the 10th century. Aside from artifacts, and pottery, writing has even been found, shattering just about everything many scholars thought they knew about the development and spread of literacy. Carbon-14 dating is really making this a discovery hard to dismiss as significant. Here is the homepage of the excavation team, where you will find some photos. Indeed, the article goes on to explain that the evidence being collected is clearly dissimilar from Philistine culture. The scholarly world is all a-buzz with the find. Even skeptical scholars--who have staked their reputation on minimalistic claims--are now making some very telling admissions. Apparently, this is only the tip of the iceberg. Much more is coming out, as someone close to the dig explained on Jim West's blog. John Hobbins at the blog Ancient Hebrew Poetry has even called it the "end of minimalism as we've known it". He writes, "Minimalism will go down in the annals of scholarship as a classic example of over-reach." I think he's absolutely right. Again, caution is always necessary. I've been sitting on this for 2 months now. However, the evidence is really striking. I think the likelihood that we have here a significant find--one involving a seismic shift--is very high. In fact, what we are witnessing here to assumptions made in Old Testament scholarship may be quite similiar to what happened in the 20th century in New Testament studies. Many scholars at that time believed the Fourth Gospel, for example, was a late creation--a second century document with no historical value. Then of course a fragment of it was found in Egypt dating to the turn of the second century. As a result, a lot of the books that were hot items in libraries got put back on the shelf. They are collecting dust to this day. Given that minimalists are now making some key admissions about this find, I think it is safe to say that something similar is going to happen to a lot of the books now being checked-out by students on the history of Israel. But again we'll have to wait and see what else comes out of this discovery. In the comment box I received the following from Barnea Levi Selavan, the codirector of the organization behind the excavation, to whom I am very grateful for the following information. I am Codirector of the Foundation Stone organization. We are developing the Elah Fortress/Qeiyafa site, and are responsible for the excavation of Prof Garfinkel of Hebrew U. I appreciate your words. I invite you to see the promo movie and articles on our website www.elahfortress.com, and must share with you there is even more. The massive fortified city, the unprecedented 10 ton stones, in the unprecedented second gate of an Iron Age city -which may identify it as Sha'arayim, "Two-Gates", mentioned three times in the Bible in this area, twice related to King David before he became king, which would fit its early dating-the clear destruction layer context, an opportunity to examine the workings of the architecture of the casemate wall and houses(21,400 pieces of pottery pulled from 600 square meters), the absence of pig bones, the seemingly destroyed and reused cultic stone, the location at the gateway between the Judean Foothills and the Philistine Coastal Plain, the consensus of scholars that it the pottery typology is early 10th century, the consensus of all the major Philistine excavators that the pottery "is not a coastal ssmeblage"-Sy Gitin- so it is not Philistine, the early proto-Canaanite Hebrew writing with its implications of how and when this writing spread to the Greeks and others, the interesting words and the potential historical value of its actual text, the range of hi-tech imaging methods used to see the letters not visible to the naked eye, the over 100 jug handles with finger impressions until now found only a couple at a time and not valued as a feature, the short Hellenistic-Ptolemaic period reuse of the fortifications, and their strategic approach to fortifications, the short term use of the city - as there is no remodeling, the carbon-14 dating range of burnt olive pits, the potential revising of the transition or even structure of dating Iron Age I and Iron Age II, the surety of more discoveries because of the layout of the casemate walls, the elephant in the room- the historical implications for the accuracy of events and characters reported in the bible, as the urban society of 300o years ago (dating based on science alone-the pottery typology and carbon-14 dating; the ostracon found in the same destruction layer context in a tightly-controlled provenanced excavation) was using writing, not only oral traditions, and this means a higher degree of accuracy is expected in transmission of acts and events, even if passed down to several hundred years later, even as academics currently claim (contrary to ancient Jewish traditions of literacy accuracy and writing throughout, and when the books were written) .... I may have missed something. There is also a funny clip from Saturday Night Live where the excavation is mentioned--be sure to check it out at their website. Dulles was a rarity in many ways. In 2001, John Paul II created him a Cardinal, making him the first American born theologian who was not a Bishop to receive such an honor. When Pope Benedict came to America this year he made a special request to visit Cardinal Dulles (see above). HAVING LEARNED WITH SADNESS OF THE DEATH OF CARDINAL AVERY DULLES, I OFFER YOU MY HEARTFELT CONDOLENCES, WHICH I ASK YOU KINDLY TO CONVEY TO HIS FAMILY, HIS CONFRERES IN THE SOCIETY OF JESUS AND THE ACADEMIC COMMUNITY OF FORDHAM UNIVERSITY. I JOIN YOU IN COMMENDING THE LATE CARDINAL’S NOBLE SOUL TO GOD, THE FATHER OF MERCIES, WITH IMMENSE GRATITUDE FOR THE DEEP LEARNING, SERENE JUDGMENT AND UNFAILING LOVE OF THE LORD AND HIS CHURCH WHICH MARKED HIS ENTIRE PRIESTLY MINISTRY AND HIS LONG YEARS OF TEACHING AND THEOLOGICAL RESEARCH. AT THE SAME TIME I PRAY THAT HIS CONVINCING PERSONAL TESTIMONY TO THE HARMONY OF FAITH AND REASON WILL CONTINUE TO BEAR FRUIT FOR THE CONVERSION OF MINDS AND HEARTS AND THE PROGRESS OF THE GOSPEL FOR MANY YEARS TO COME. TO ALL WHO MOURN HIM IN THE HOPE OF THE RESURRECTION I CORDIALLY IMPART MY APOSTOLIC BLESSING AS A PLEDGE OF CONSOLATION AND PEACE IN OUR LORD JESUS CHRIST. 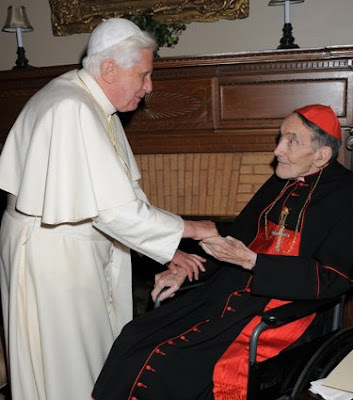 Whenever a cardinal dies, the Vatican news always carries word of it. However, this Sunday, in addition to the usual coverage of a cardinal's death, the L'Osservatore Romano will run a piece highlighting his contribution to Theology--something which is unusual for the paper. All this just underscores his unique significance. 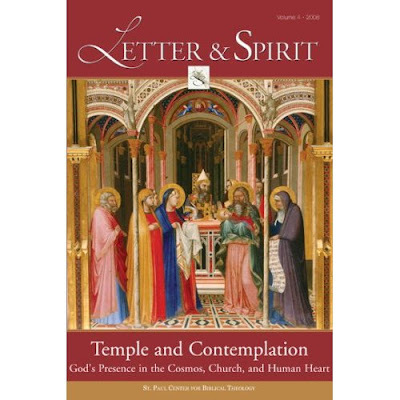 One of Dulles' last pieces, "The Church and the Kingdom: A Study of their Relationship in Scripture, Tradition, and Evangelization," appeared in last year's Letter and Spirit, the academic journal put out by the St. Paul Center (purchase here). It is my favorite of his articles. Of course, there are many others that could be mentioned. For the sake of highlighting at least one, I thought I'd mention his, "The Death of Jesus as Sacrifice," which first appeared in Josephinum Journal of Theology [Vol. 3, No. 2 (Summer/Fall 1996)]. It is now available on-line via the St. Paul Center's website. The article tackles the question of the meaning of Jesus' death. In particular, Dulles argues for a theory of "personalist" approach to "atonement". He takes on other models, such as the theory of "penal substition", i.e., the idea that Jesus' death should be understood in terms of a legal exchange in which Jesus in effect takes the place of sinners. Sinners receive Christ's sonship, Jesus receives the punishment they deserve. A personalist framework of thinking calls for a radical transformation of this concept of atonement... 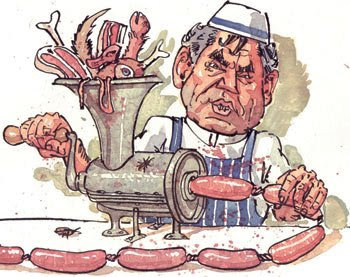 In primitive mythological thinking, as I have said, guilt is understood in crassly material or objective terms, and consequently atonement is depicted as the mere substitution of one thing for another, as would be the case when an old tire is replaced by a new one, which will itself eventually be replaced. But in a personalized framework, there is no way in which one person can simply replace another. One person may represent another, but cannot substitute for that other except in a merely functional way. As Dorothee Sölle has brilliantly explained, substitution is the definitive exchange of reified objects, whereas representation is the provisional intervention of persons on behalf of other persons. To retain this distinction, it seems preferable to avoid speaking of "substitutionary atonement" in the case of Jesus Christ. Sölle herself proposes to speak rather of Christ the Representative... Christ's redemptive act, unlike the merely mechanical substitution of the scapegoat, is the loving identification of the innocent sufferer with the guilty on behalf of whom he suffers. However, it cannot be understood in merely moral or psychological terms, as the vocabulary of "loving identification" might seem to imply. Even when personalistically interpreted, "substitution" does not do justice to the reality, since a substitute could not do for us any more than we could do for ourselves. In view of his theandric constitution as incarnate Son of God, Christ is able to do far more for us than any human person could do. He stands before the Father as the representative head of the new, reborn humanity. He is the Second Adam, the progenitor in the order of grace, the firstborn of the dead (1 Cor 15:45; Rom 8:29; Col 1:18). Alone among human beings, he is qualified to remove the guilt of human sin and to communicate divine life. Does the vicarious nature of redemption mean that Jesus is punished in our place? Some authors, indulging in very powerful rhetoric, describe in lurid terms the way in which the wrath of the eternal Father was visited upon the guiltless Son, so that he felt rejected and even hated by God... 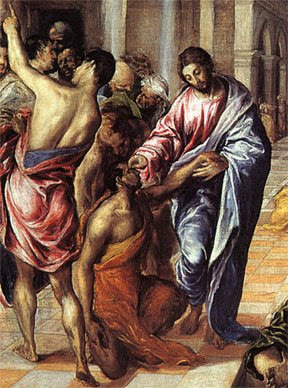 Some go so far as to suppose that Jesus suffered a loss of faith, fell into despair, and underwent the pains of the damned. 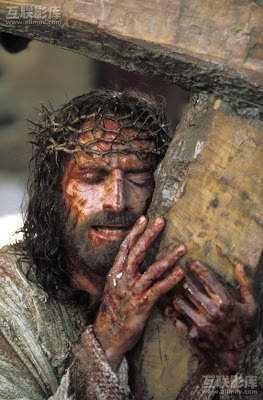 His cry on the Cross, "My God, my God, why hast thou abandoned me?" (Matt 27:46 & parallels) is considered to confirm this interpretation. "I will tell of thy name to my brethren; In the midst of the congregation I will praise thee... All the ends of the earth shall remember and turn to the Lord. (Ps 22:22, 27; cf. Heb 2:12)." It would be a mistake, therefore, to interpret the words quoted by Jesus as though he were describing his psychological state of feeling rather than referring to the religious message of the Psalm. The advantages of the representational sacrifice theory, and the answers to the objections raised against it, may be clarified by a review of the alternative theories described at the opening of this paper. In some ways the sacrificial interpretation, as I have proposed it, resembles the first theory, that of penal substitution, but the differences are important. Both theories maintain that Jesus suffered terrible ordeals and thereby won for sinners a release from the pains they deserve. But the penal substitution theory makes it appear that God punishes the innocent in place of the guilty, thereby suggesting that God is unjust. The theory of representative headship, by contrast, looks upon Jesus as one who offered satisfaction, rather than endured punishment. These are true alternatives. As Anselm insisted, sin requires either punishment or satisfaction; satisfaction takes the place of punishment... Satisfaction is voluntarily given, whereas punishment must be coercively endured. Satisfaction, unlike punishment, can be offered by the innocent as well as by the guilty. Punishment, as an act of justice, must be strictly proportioned to the offense, but satisfaction, as a work of love, may be superabundant. According to Thomas Aquinas, Christ "offered to God more than was required to compensate for the sin of all humanity." In his superfantastic book, Jesus of Nazareth, Pope Benedict makes the case that the Beatitudes are represent a "sort of veiled interior biography of Jesus" (p. 74). Here are the Beatitudes. persecuted the prophets who were before you." The Pope lists many of the ways the Beatitudes can be seen as fulfilled in the life of Jesus. In sum, the Beatitudes point us to Jesus: He is the merciful Son of God, the true peacemaker, who suffers for righteousness sake. But more than that, there's another way to see this passage as describing the "Messiah". Scholars point out numerous similarities between the Beatitudes and Isaiah 61. "The Spirit of the Lord GOD is upon me, because the Lord has anointed me to bring good tidings to the afflicted" (Isa 61:1-2). A few things can be noted here. The word here for "anointed" is, of course, מָשַׁח, mā∙šǎḥ, or "messiah". That the "anointed" one here was understood by first-century Jews as not only an anointed one, but as the Messiah is clear from the Dead Sea Scrolls (4Q521), which uses this passage in connection with a description of the coming of the Messiah. Also familiar should be the fact that this "messiah" comes "to bring good tidings". The Septuagint (the Greek version of the Old Testament) uses a verb here euangelizō (εὐαγγελίσασθαι). The word is where we get the English, "Evangelist". The noun form of this Greek word is euangelion (εὐαγγέλιον)--and it is translated "Gospel" in the New Testament. In other words, Isaiah 61 describes a "messiah" who brings the "Gospel". 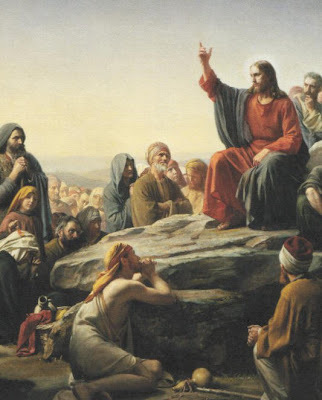 Right before Matthew 5, which begins with the Beatitudes, Matthew 4 closes by telling us how Jesus went through all Galilee "preaching the gospel of the kingdom" (Matt 4:23). "Blessed are the poor [πτωχοὶ] in spirit" (Matt 5:3) is echoed in Isaiah 61:1: "The Spirit of the Lord GOD is upon me, because the Lord has anointed me to bring good tidings to the poor [πτωχοῖς]". "Blessed are those who mourn [πενθοῦντες], for they shall be comforted [παρακληθήσονται]" (Matt 5:4) evokes, Isaiah 61:2, "‘to comfort all who mourn’ [παρακαλέσαι πάντας τοὺς πενθοῦντας]"
"Blessed are the meek [poor; πραεῖς] for they shall inherit the land [or 'earth'; κληρονομήσουσιν τὴν γῆν]" (Matt 5:5) mirrors Isaiah 61:2, "‘to preach good news to the poor [Heb. anawim; Grk. πραεῖς]" and Isa 61:7: “in your land you shall possess a double portion”. Of course, the language of "double portion" is closely tied to inheritance in the Old Testament (cf. Duet 21:27). "Blessed are those who hunger and thirst after righteousness, for they shall be satisfied" (Matt 5:6). The word translated "satisfied" is literally "to eat one's fill" (χορτάζομαι; chortazomai; cf. Matt 15:33; John 6:26). Righteousness’ occurs three times in Isaiah 61 (v. 3. 8, 11). Strikingly in Isaiah 61:6: God promises that his people will "eat the wealth of nations". "Blessed are the pure of heart (οἱ καθαροὶ τῇ καρδίᾳ), for they shall see God" (Matt 5:8) echoes Isaiah 61:2, which explains that the Messiah is sent to "to heal the brokenhearted" (συντετριμμένους τῇ καρδίᾳ). "Blessed are those that have been persecuted for righteousness’ sake, for theirs is the kingdom of heaven" (5:10) can be said to mirror the entire point of Isaiah 61--the Messiah is coming to announce that the "good news" that Zion's persecution has ended. The Kingdom is coming. Finally, "Blessed are you when men revile you… rejoice and be glad (ἀγαλλιᾶσθε) (Matt 5:11-12) has a parallel in the language of Isaiah 61:10: "Let my soul be glad (ἀγαλλιάσθω) in the Lord". In sum, for first-century Jews Isaiah 61 could be read as describing the coming of the Messiah. The Beatitudes draw heavily on this description of the Messiah and what he would do for God's people--he will make his people a messianic people. Jesus in the Beatitudes then is calling His disciples to be that people by imitating Him. He is the Messiah come to bring the "good news". He calls us to be a truly messianic people. Singing in the Reign has been listed one of the top 50 biblioblogs (and so we get to post this cool little icon!). A biblioblog is a blog that covers Scritpure study, and is usually written by an academic. Many of them are written by world famous scholars, e.g., Mark Goodacre, Scot McKnight, Ben Witherington III. Singing in the Reign has been ranked as #21, up from #31. It is an honor to be right behind our good friend, the eminent Chris Tilling at #21. I believe there is only one other blog written by a Roman Catholic on the list put together by N. T. Wrong. (Pictured to the right: Jacob Neusner, "the Pope's favorite Rabbi"). 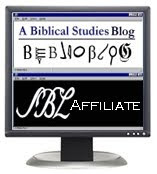 On his stimulating blog, A New Testament Student, Josh McManaway talks a little bit about the discussion at the Society of Biblical Literature on "Secret Mark". In short, "Secret Mark" is supposedly a non-canonical version of Mark's Gospel that was "discovered" in a previously unknown letter of Clement of Alexandria. It was "found" by a scholar named Morton Smith. At the time it was released some people saw the discovery as a major breakthrough. Smith used it to argue that Jesus had been a homosexual magician. 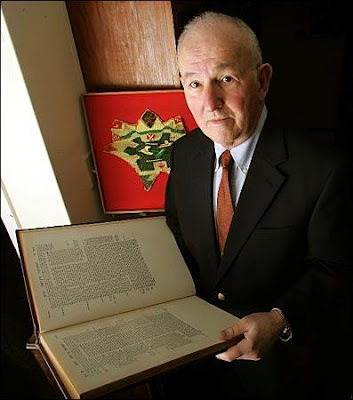 One scholar who has been forthright about his suspicions about the "find" is one Smith's former students, Jacob Neusner (pictured on the right). Neusner, of course, is one of the world's top rabbinic scholars. 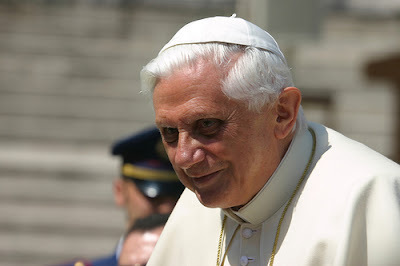 Time has called him "the Pope's favorite rabbi" due to the fact that Benedict XVI interacts with him quite a bit in his recent book, Jesus of Nazareth. Neusner has also spoke several times of his high regard for Benedict's scholarship. Neusner writes about Smith in the republished edition Birger Gerhardsson's, Memory and Manuscript: Oral Tradition and Written Transmission in Rabbinic Judaism and Early Christianity [1961; repri., Grand Rapids, Eerdmans, 1998]. Neusner explains that Smith was not only a master at misrepresenting archaeological "discoveries". While we may never know exactly what Smith discovered (if anything at all). Smith was also excellent at misrepresenting works we actually can go back and read, such as Gerhardsson's. Previously Neusner had been highly dismissive of Gerhardsson's scholarship. In fact, in the past many scholars rejected Gerhardsson's work. But, as Neusner explains, this was in large part due to the fact that Gerhardsson's arguments were unfairly misrepresented by his critics. Indeed, Neusner explains that Gerhardsson was wrongly blackballed by the academic community. In particular, he singles out Smith as a major culprit in all of this. Neusner's words are about as stinging as they come. It astonishes me to find people in the field of biblical studies who still are influenced by the inaccurate portrait of Gerhardsson's work. I often direct them to this piece of Neusner's. The words are biting. To be honest, it's a bit uncomfortable to read. I think Neusner is trying to shock readers back into reading Gerhardsson. When they do, I think Neusner believes people will see how wrongly he was treated and will appreciate the anger he directs toward Smith, who helped ensure he wouldn't get a fair hearing. Whether that justifies his harsh tone is another matter. Perhaps Neusner is attempting to treat Smith with some of Smith's own medicine. I don't direct people to read this because it's the tone I would take. What it does, however, is underline how passionate Neusner is about exposing the wrongful treatment Gerhardsson received. And that is a sentiment that I certainly share. The following is taken from Neusner's Foreword. "[R]eaders [of Gerhardsson's work] missed his careful qualifications, his thoughtful word-choices. In giving the work a negative reading on grounds of an uncritical retrojection of techniques attested only much later on into the age of the Evangelists, I followed the lead of my then-teacher, Morton Smith, with whom I wrote my dissertation just before Gerhardsson's book appeared, and whom I extravagantly admired, but not without solid reason, for his powers of penetrating criticism. To understand Smith's influence we have to identify the particular traits that he cultivated. And to place in perspective Smith's reading of Gerhardsson, we have to take a second look at his principal critic, Morton Smith himself. As to the scholarly fraud [=the Secret Gospel of Mark], who speaks of it any more, or imagines that the work pertains to the study of the New Testament at all? I need not remind readers of this reprint of the scandal of Smith's 'sensational discovery' of the Clement fragment, the original of which no one but Smith was permitted to examine. Purporting, in Smith's report, to demonstrate that the historical Jesus was 'really' a homosexual magician, the work has not outlived its perpetrator. In the end many were silenced--who wanted to get sued?--but few were gulled. Beyond [his] three major scholarly projects--as I said, a self-certified Ph.D. dissertation that no one in the degree-granting university could evaluate, an exemplary work done under the tutelage of a great scholar but lacking all consquence in scholarly discourse, and a forgery and a fraud, beyond occasional articles of uneven quality but occasional brilliance, Smith produced a few potboilers, on the one side, and a corpus of book reviews of a supercilious and misleading character. And one of these--alas!--dismissed and denied a hearing to Memory and Manuscript, as Gerhardsson says with complete justification, 'in a caricuatured and misleading way.' And let me plead guilty to Gerhardsson's indictment: 'This misprepresentation, and Smith's rather simplistic courter-arguments, were repeated, in even more simplified forms, by countless critics.' I was one of these, and I apologize in word and, here, in deed." --Jacob Neusner, "Foreword," in Birger Gerhardsson, Memory and Manuscript. Oral Tradition and Written Transmission in Rabbinic Judaism and Early Christianity with Tradition and Transmission in Early Christianity (1961; repri., Grand Rapids, Eerdmans, 1998), xxvi-xxvii. Well, Michael and I are back from SBL! (For those of you who aren't familiar, SBL is the annual meeting of the Society of Biblical Literature. Every November, thousands of nerds--I mean, scholars--converge upon some unsuspecting city and spend three or four days sharing papers, ideas, and drinks. All in all, a grand time). Amazing Conversations: Saturday night Michael and I went out to dinner for our annual meeting of Catholic scholars and friends, such as Scott Hahn, Timothy Gray, Jeff Morrow, and Father Pablo Gadenz. I was excited this year to share the feast with fellow bloggers and Josh McManaway (New Testament student) Mark Giszczak (Catholic Bible Student). We had an unbelievable conversation about the future of Catholic biblical studies, the papal Synod on Scripture, the importance of philosophy in the formation of biblical scholarship, and several wacky theories of my own (such as the notion that the Pharisees were a priest-led movement) that I threw out at the end as the wine began to get to me. On Sunday night, I was invited by James Ernest (of Baker Academic) to have dinner with Dale Allison, Larry Hurtado, and Simon Gathercole. Again I was somewhat impetuous and turned the conversation to Bauckham's Jesus and the Eyewitnesses the scholarly myth that the Gospels ever circulated anonymously. Well, boy, let me tell you--the sparks began to fly! Don't get me wrong, everything was friendly, but Bauckham has certainly touched a nerve and opened the door to an extremely memorable night of conversations. I was delighted to learn afterward that Dale Allison is wrapping up his own 'big Jesus book' which should be coming out from Baker. That will be a must buy. Famous Scholars: this year I met several scholars I had not met before. In particular, Michael and I had a fantastic conversation with Craig Evans (author of Fabricating Jesus and Jesus and His Contemporaries) about the authorship and historicity of the Gospels. Also a first for me was meeting Aquila Lee, (author of From Messiah to Preexistent Son), who was kind enough to attend my paper in the Historical Jesus section. Then of course there was the pleasure of having dinner with Simon Gathercole and Larry Hurtado, both of whom I hadn't met before. When Were the Pastoral Epistles Written? Those of you familiar with the standard introductions to the New Testament will be aware that it is common fare for modern scholarship to treat the Pastoral Epistles (1-2 Timothy, Titus) as a distinct grouping of letters within the Pauline corpus that is regarded as pseudonymous: i.e., falsely ascribed to Paul. From this perspective, these three letters--which are clearly written around the same time to address similar issues--are commonly attributed to an unknown "disciple of Paul" who wrote them up in his name, sometime in the 80s-90s of the first century. Indeed, some scholars would even go so far as to date them to the late 2nd century A.D. Although there are a number of reasons given in support of this claim of pseudonymity, one of the most common is that Paul's opponents in the Pastoral Epistles are supposedly different from his opponents in his "authentic" letters. Specifically, supporters of pseudonymity often identify the opponents in the Pastorals as early Christian gnostics. 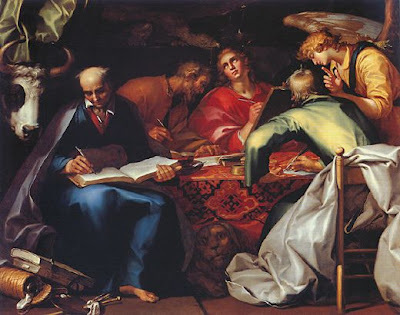 Because gnosticism is often held not to have developed in the early Church until the late first or early second century A.D., this fact is held out as proof that Paul could not have written the Pastorals. But is this correct? 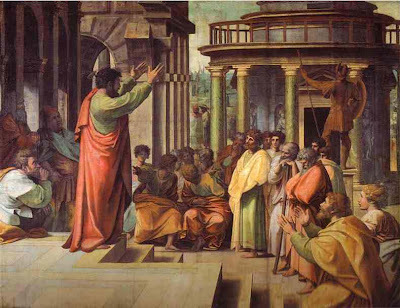 Are Paul's opponents in the Pastorals really the gnostics? True, Paul does give a fleeting warning at the end of 1 Timothy to avoid "what is falsely called knowledge" (Gk gnosis) (1 Tim 6:20), but this hardly constitutes an uneqivocal reference to early Gnosticisism. Indeed, even a supporter of pseudonymity such as Raymond Brown admits that, even when one accepts the gnostic hypothesis, "the exact nature of what is being criticized in the Pastorals is hard to discern" (Intro. to the New Testament 665)? Notice here that Paul's injunction to the bishop to teach sound doctrine is not some kind of abstract 'church rule', but is specifically ordered toward refuting and silencing the circumcision party. Indeed, in the Pastoral epistles, the various references to dissidents identify them as those who claim to be "teachers of the Law" but are not (1 Tim 1:7), and those who foster "quarrels over the Law" (Titus 3:9). Does this sound like the kind of controversies with Gnosticism that the Church was wrestling with in the second century A.D.? Not to me. To me it sounds like the Pastoral epistles reflect the final stage of Paul's life, say, in the mid-60s, after his imprisonment in Rome, when the Circumcision faction that had plagued his early missionary efforts in Galatia continued to spread and cause division within the Churches he had planted. When the references to the circumcision party and controversy over the Jewish law are given due weight, it seems to me that the situation addressed by the Pastoral epistles gives good reason for thinking them early first-century and authentic. We put this video up on youtube last night. It now has over 8,400 hits and is rated, as of this writing, the #1 "Favorited" video of the day. Special credit must go to Matt Connors, a very talented JP Catholic sophmore, who filmed the intro, recorded the audio and edited it all together in less than a day. Please help us spread it around. For more on this issue see this important article. UPDATE: As of 10pm, the video has over 13,000 hits and has received a number of honors. In its category, Nonprofit and Activism, it is the #1 Most viewed video and the #1 Rated video. It also tops categories for other countries: e.g., #2 Most viewed in Mexico, Japan and South Korea, #3 Most viewed in Israel! A couple of new things available from the St. Paul Center for Biblical Theology. First, the SPC has radically revamped its website. All I can say is, wow, what a transformation! I especially like the running blog from Scott Hahn and Mike Aquilina. Go check it here. Of course of the most impressive things the St. Paul Center is responsible for is its academic journal, Letter and Spirit. The latest edition, Temple and Contemplation: God’s Presence in the Cosmos, Church, and Human Heart is now available. I just ordered a copy--I couldn't wait any longer!--and I'll be talking more about it after I've received it. In particular, I'm excited about the article written by SITR co-blogger, Brant Pitre: "Jesus, the New Temple, and the New Priesthood". His article focuses on the same themes I'm treating in my dissertation, which is entitled, "The Historical Jesus and Cultic Restoration Eschatology: The New Temple, the New Priesthood and the New Cult in the Synoptic Gospels." Temple, Holiness, and the Liturgy of Life in Corinthians--Raymond Corriveau, C.S.s.R. The Indwelling of Divine Love: The Revelation of God’s Abiding Presence in the Human Heart--Thomas Dubay, S. M.
The Great Commentary of Cornelius a Lapide, 4 vols. 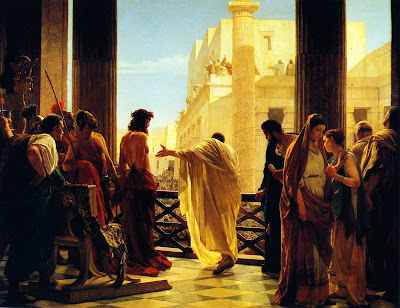 "Pilate said to them, “Whom do you want me to release for you, Barabbas or Jesus who is called Christ?” ﻿18﻿ For he knew that it was out of envy that they had delivered him up. ﻿19﻿ Besides, while he was sitting on the judgment seat, his wife sent word to him, “Have nothing to do with that righteous man, for I have suffered much over him today in a dream.” ﻿20﻿ Now the chief priests and the elders persuaded the people to ask for Barabbas and destroy Jesus. ﻿21﻿ The governor again said to them, “Which of the two do you want me to release for you?” And they said, “Barabbas.” ﻿22﻿ Pilate said to them, “Then what shall I do with Jesus who is called Christ?” They all said, “Let him be crucified.” ﻿23﻿ And he said, “Why, what evil has he done?” But they shouted all the more, “Let him be crucified” (Matt 27:17-23). --B. F. Streeter, The Four Gospels: A Study of Origins (London: Macmillan, 1924), 377. Some of you may know this already, but there is an ancient Rabbinic tradition regarding sacrifice in the the Messianic Age. Although I've read it dozens of times, I'm still stunned every time I see it. In the Age to Come all sacrifices will cease, but the thank offering will never cease; all songs will cease, but the songs of thanksgiving will never cease." (Cited in Hartmut Gese, Essays in Biblical Theology 133). In Hebrew, the word for "thank offering" is todah; in Greek, it is eucharistia. The thank offering was a special sacrifice that consisted of both a bloody offering (of a lamb or goat) and an unbloody offering (of bread or wafers) (see Leviticus 7). According to the prophet Jeremiah, the saved will celebrate with thank-offerings at the coming of the Messiah and the ingathering of the exiles (Jeremiah 33). The obvious question raised by this is: Did Jesus see the Last Supper as the eschatological sacrifice which would replace all the other sacrifices in the Age to Come? Pope Benedict addressed the Bishops gathered for the Synod discussing the role of Scripture in the life of the Church. In particular, he talked about the need to build a bridge between exegesis and theology. Dear Brothers in the Episcopate, dear brothers and sisters! At the start of our Synod, the Liturgy of the Hours offers us a passage from the great Psalm 118 [Psalm 119 in modern numbering] on the Word of God: a eulogy of his Word, expression of Israel's joy at being able to know it, and in it, to know his will and his face. I would like to meditate with you on some verses of this excerpt from the Psalm. It speaks of the solidity of the Word. It is solid, it is the true reality on which to base one's life. Let us recall the words of Jesus who continues these words of the Psalm: "Heaven and earth will pass away, but my words never will". Humanly speaking, the word, our human word, is almost a nothing in reality, a whiff of breath. No sooner said, it vanishes. It seems to be nothing. And yet the human word has an incredible power. They are words that make history, they give shape to our thoughts, thoughts which give rise to words. Words shape history and reality. But much more so is the Word of God which is the basis of everything - it is the true reality. And to be realists, we must depend on this reality. We should change our idea that material things, those that are solid, that can be touched, are the most solid and sure realities. At the end of the Sermon on the Mount, the Lord tells us the two possibilities of constructing the house of our own life: on sand or on rock. He who builds only on visible and tangible things, on success, on career, on money, builds on sand. These seem to be the realities. Only the Word of God is the foundation of all reality - it is as stable as heaven, and more than heaven. It is reality. So we must change our concept of realism. The realist is he who recognizes in the Word of God - this reality which can appear to be so weak - the foundation of everything. The realist is he who builds his life on this foundation which will stay permanently. Thus these first verses of the Psalm invite us to discover what is reality and in this way, to find the foundation of our life, how to build our life. The next verse says: "Omnia serviunt tibi" (All things are your servants). All things come from the Word, they are a product of the Word. "In the beginning was the Word". In the beginning, heaven spoke. And so, reality is born from the Word, it is 'creatura Verbi', a creature of the Word. Everything is created from the Word, and everything is called on to serve the Word. This means that all of creation, ultimately, was ideated to create the place of encounter between God and his creatures, a place where the love of the creature responds to divine love, a place where the love story between God and his creatures takes place. "Omnia serviunt tibi". The story of salvation is not a small event, in a poor planet lost in the immensity of the universe. It is not a minimal thing that is happening by chance in an out-of-the-way planet. It is the mover of everything, the aim of creation. Everything was created so that this story would take place - the encounter between God and his creature. In this sense, the story of salvation, the covenant with God, preceded creation. In the Hellenistic period, Judaism developed the idea that the Torah (the Jewish book of laws) had preceded the creation of the material world. This material world was created only to provide the setting for the Torah, to the Word of God which creates a response and becomes a story of love. Already, the mystery of Christ shines through. It is what we are told in the Letters to the Ephesians and to the Corinthians: Christ is the protòtypos, the firstborn of Creation, the idea for which the universe was conceived. He embraces everything. We enter into the movement of the universe by uniting ourselves to Christ. We might say that while material creation is the condition for the story of salvation, the story of the covenant is the true reason for the cosmos. We come to the roots of being by arriving at the mystery of Christ, to his living Word which is the purpose of all creation. "Omnia serviunt tibi". Serving the Lord, we realize the purpose of being, the purpose of our own existence. Let us jump forward. "Mandata tua exquisivi" (I shall consider your commands with care). We are always in search of the Word of God. It is not just present in us. If we stop at the letter of the Word, we have not necessarily understood the Word of God. There is the danger that we only see the human words and fail to find within the true actor, the Holy Spirit. We do not find the Word in words. St. Augustine, in this context, reminds us of the scribes and Pharisees consulted by Herod when the Magi arrived. Herod wanted to know where the Savior of the world would be born. They knew it, and gave him the correct answer; Bethlehem. They were great experts, who knew everything. And yet, they did not see reality, they did not recognize the Savior. St. Augustine says - they showed the way for others, but they themselves did not move. This is a great danger,too, in our reading of Scripture: we stop at the words, human words from the past, a history of the past, and we do not discover the present in the past, the Holy Spirit which speaks to us today in words from the past. And so we fail to enter into the interior movement of the Word, which hides in human words and opens the divine words. That is why there is always need for 'considering with care'. We should be in search of the Word within words. Therefore, exegesis, the true reading of Sacred Scripture, is not simply a literary phenomenon, it is not limited to reading the text. It is the movement of my own existence. It is moving towards the Word of God in human words. Only by conforming to the mystery of God, to the Lord who is the Word, can we enter into the Word, only then can we truly find the Word of God in human words. Let us pray to the Lord that he may help us to search not only with the intellect, but with all our existence, to find his Word. In the end: "Omni consummationi vidi finem, latum praeceptum tuum nimis" (I have seen the limits of all perfection, but your command is without bounds). All human things, all the things we could invent or create, are finite. Even all the human religious experiences are finite, they show an aspect of reality, because our being is finite and always understands only a part, some elements. "Latum praeceptum tuum nimis": Your command is without bounds. Only God is infinite. And so even his Word is universal and does not not recognize any limits. And so in entering the Word of God, we are truly entering into the divine universe. We leave the limitations of our experiences and enter into that reality which is truly universal. Entering into communion with the Word of God, we enter into the communion of the Church that lives the Word of God. We are not entering a small group, into the order of a small group , but we go beyond our personal limits. And we go towards largeness. the true largeness of the only truth, the great truth of God. We are really into the universal, into the communion of all our brothers and sisters, of all mankind, because in our heart is hidden that desire for the Word of God which is one. That is why even evangelization, the announcement of the Gospel, mission - these are not a kind of ecclesial colonialism with which we want to bring others into our group. It is leaving the limits of single cultures towards the universality that links everyone, unites everyone, makes us all brothers. Let us pray too that the Lord may help us enter truly into the 'largeness' of his Word and thus open ourselves to the universal horizon of mankind, that which unites us despite all our differences. Let us turn back to a preceding verse: "Tuus sum ego: salvum me fac" (I am yours; save me) (v. 94). it is translated into Italian as 'I am yours'. The Word of God is like a ladder which we can climb, and with Christ, descend as well into the depths of his love. It is a way to get to the Word within words. Because this Word has a face - it is a person, Christ. Before we can say "I am yours", he has already told us "I am yours'. The Letter to the Hebrews, citing Psalm 39, says: "A body you have prepared for me... And so I said, Here I am, I am coming". The Lord prepared himself a body to come to. With his Incarnation, he said, "I am yours". And in Baptism, he tells me: "I am yours". In the Sacred Eucharist, he says the same thing anew, "I am yours", so that we may respond, "Lord, I am yours". In the journey towards the Word, entering into the mystery of his Incarnation, of his 'being with us', we wish to appropriate his being to ourselves, we want to expropriate ourselves of our existence, giving ourselves to him who gave himself to us. "I am yours". Let us pray to the Lord to be able to learn with our whole existence to say these words. Thus we will be in the heart of the Word. And thus we shall be saved. JP Catholic students are all over two big propositions in California--and now the mainstream news media is taking notice of their efforts. First, Proposition 4, or Sarah's Law, would require parental notification for abortion. Right now, a high school can't give an asprin to a student without notifying parents--but a child can get an abortion and the parents don't have to know a thing about it. This, of course, enables child predators, as our students highlight in this ad. This ad aired in California on television immediately after the Vice Presidential debate last Thursday. Second, Propoisition 8 would ammend the state constitution to define marriage as between one man and one woman. Yes, we already voted on this a few years ago and such a definition won a majority of the vote (61%). But the California Supreme Court ruled (4-3) that the vote didn't matter and legalized gay marriage despite the vote. The students have been making ads for that as well. Their ads have become an internet sensation--the LA Times even reported their efforts in a recent story. For the record, Steve Marshall is right on about the impact these ads can have. While a TV spot reaches far more homes--no doubt about that!--one should remember that TV ads are often simply blocked out. During the commercials you run to the kitchen to get a soda, you fast forward through them if you're watching them on DVR, etc. An internet ad is clicked on by the viewer--the audience is FAR more likely to actually watch the ad. They also reach a different audience than say the people who watch Dancing with the Stars. For more about JP Catholic, go to the website. Our students at JP Catholic (John Paul the Great Catholic University) have worked on a new ad which supports Prop. 8 in California, which would ammend the state constitution and rein in the activist judicial branch here. I love it that Catholic students are learning how to use the media like this. Just wait a few more years--I'm sure they will have really perfected their skills by then. If you're looking for a college that is more than just a school but a place where you become part of a mission, check out www.jpcatholic.com. READ THIS BEFORE YOU PUSH PLAY!!! I can't believe this is on-line! This song is hilarious. It draws from the imagery of "bowls" of judgment being poured out in Revelation 16. It is performed by a Christian Punk Band that made huge waves in the 90's. And I mean, they were big--Johnny Cash loved them and even became closely associated with them. He even performed with them! What started out as a lark between some youth ministers became a phenomenon--a hilarious Christian punk band. I don't get the skateboard stuff in the video and the studio version is much better, but this is still worth it. Here are the lyrics... they're hilarious. A ghastly frown fell to his face, "You like this golden calf?" "Well, get your knifes and slay it and have a bowl of wrath"
In addition to dissimilarity from Judaism and dissimilarity from Christianity, another criterion frequently appealed to is multiple attestation. John P. Meier defines it as a criterion which looks at sayings or actions of Jesus “that are attested in more than one independent literary source (e.g., Mark, Q, Paul, John) and/or in more than on literary form or genre (e.g., parable, dispute story, miracle story, prophecy, aphorism).” In other words, the likelihood of the historical reliability of something increases if it is found in more than one source and even more so if it is found in more than one literary context. Furthermore, that some elements are found multiply attested and others not may be little more than historical accident. N. T. Wright explains: “…the number of times a saying happens to turn up in the records is a very haphazard index of its likely historicity or otherwise.” Thus, that something is multiply attested does not therefore make it historical. Moreover, the criterion is largely dependent on the two-source theory (Mark and Q),  to which a growing number of scholars have offered serious challenges. After an exhaustive analysis of the various solutions to the Synoptic Problem, Sanders concludes with Davies. Mark Goodacre, professor of New Testament at Duke Univesity and editor of one of the most presitigious monograph series has leveled one of the most devastating critiques against Q in his The Case Against Q.
 Meier, A Marginal Jew, 1:174. Meier here combines what are sometimes seen as two criteria, that of multiple attestation and multiple forms, first suggested by C. H. Dodd, History and the Gospel (New York: Scribner’s, 1937), 91-101; idem., The Parables of the Kingdom, 26-29; Holmén, “Authenticity Criteria,” 49; C. H. Dodd, The Parables of the Kingdom (London: Nisbet, 1935), 20. See Evans, “Authenticity Criteria in Life of Jesus Research,” 9. The point is made by many others, e.g., Meier, A Marginal Jew, 1:175; Fredricksen, From Jesus to Christ, 6. Furthermore, see the discussion in Allison, Jesus of Nazareth, 2-10. On the difficulty of ruling out a priori singularly attested elements, see C.F. D. Moule, The Phenomenon of the New Testament (Naperville: Allenson, 1967), 71; Warren Kelber, “Jesus and Tradition: Words in Time, Words in Space,” Semeia 65 (1995): 147 [139-67]. Wright, Jesus and the Victory of God, 51. Likewise, see Ensor, Jesus and His “Works”, 41: “…the usefulness of this criterion is limited by the fact that the Synoptic problem has not yet been finally resolved. No one theory commands universal consent, and it is not always clear from which source a saying may have come.” This weakness is recognized by others, e.g., see Craig A. Evans, The Historical Jesus: Critical Concepts in Religious Studies (New York: Routledge, 2004), 9; Stein, “The ‘Criteria’ for Authenticity,” 230-31; Achtemeier, Green and Thompson, Introducing the New Testament, 60. E. P. Sanders and Margaret Davies, Studying the Synoptic Gospels (London: SCM Press, 1989), 51-119. E. P. Sanders and Margaret Davies, Studying the Synoptic Gospels (London: SCM Press, 1989), 117 [51-119]. Elsewhere, in an analysis applicable to many contemporary scholars, Sanders has critiqued Bultmann’s method as essentially circular, since the two-source theory is established on “laws of development,” which are in turn derived from the two-source theory. See. E. P. Sanders, Tendencies of the Synoptic Tradition (New York:Cambridge University Press, 1969), 25-26. Mark Goodacre, The Case Against Q: Studies in Markan Priority and the Synoptic Problem (Harrisburg, PA: Trinity Press 2002). See also the various contributions in Mark Goodacre and Nicholas Perin, eds, Questioning Q: A Multidimensional Critique (Downers Grove, IL: InterVarsity Press, 2005).